The oil complex is showing across-the-board losses this morning relative to Friday’s closing price as the dollar moves higher. Crude prices are at $50.52, down $1.15 (2.2%) since Friday. Friday saw prices trade flat throughout the day, bound between $51.25 and $51.75. Diesel prices are significantly lower today, shedding 3.5 cents (1.9%) since Friday’s close. Prices are currently $1.7748, below $1.80 for the first time in two weeks. After prices peaked last week at $1.86, they’ve been in decline, as weakening oil prices stole strength from the rally. Merill Lynch expects diesel price weakness to be mitigated by strong exports to Latin America. Gasoline prices are also down today, pulled down by the oil price drops. Gasoline gave up 2.5 cents on Friday, and today have given up nearly 3 more cents, putting prices at $1.5613. Gasoline has been extremely weak since the post-Harvey rally that took prices to over $2.00 for a day before dropping back down. July gasoline demand was revised lower by the EIA, further contributing to the bearish sentiment surrounding gasoline. The dollar is generally higher today, gaining .6% since last week. The dollar has traded strongly for the past week due to international instability, including concerns over the Iraqi Kurd’s fight for independence. Iraq and Turkey continue to take measures to squash secession efforts. Today, Spain’s northern region of Catalonia held a vote which received over 90% support for secession from the main Spanish government. Spain has declared the vote illegal. Of course, the EU is worried about the precedent the vote could set for other countries, and is opposing the measure as well. Turns out that breaking up is hard to do. 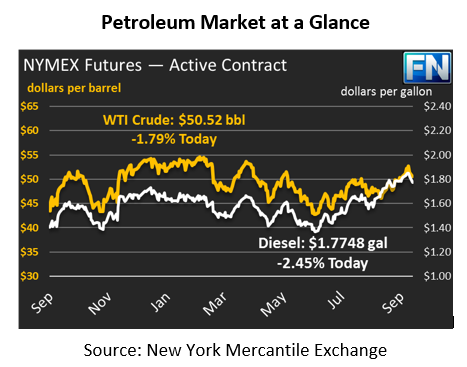 Reports of rising U.S. and OPEC production are also weighing on markets. The Baker Hughes rig count report on Friday showed U.S. rigs increasing by 6 rigs, up 325 rigs from last year. A survey showed that OPEC oil production rose by 50 kbpd from August levels, pushed up by high production in Iraq and Libya. Despite rising production, exports from Saudi Arabia to the U.S., which has been a closely tracked number following Saudi Arabia’s pledge to force U.S. inventories lower, have dropped to the lowest July value since 1987. In 30 years, only one month (during the 2008/2009 economic crisis) saw lower imports from the Saudis than July’s level. With inventories falling, it appears the Saudis have been successful in their strategy. The question is – where is the oil being diverted to, and will it eventually find its way back to the U.S. market?